Maurizio Sarri has conceded there is a problem with his system at Chelsea but insists he is planning on staying at the club for "a long time". The Blues head coach is under severe pressure following a disappointing run of results, which has included 4-0 and 6-0 Premier League defeats to Bournemouth and Manchester City respectively and a 2-0 FA Cup exit at the hands of Manchester United. Many fans booed the team's efforts following the final whistle of Monday's loss to United at Stamford Bridge, while others had voiced their displeasure with the tactics on display. There are reports Sarri could be sacked unless Chelsea see off Malmo in the second leg of their Europa League last-32 tie on Thursday and also win Sunday's EFL Cup final against City. But although he accepts there must be improvement, Sarri says he is focused on the longer term. "The system is the first problem. I know very well that when we lose, I have to put a striker on the pitch; when we win, I have to put a defender on the pitch. But I want to see football in another way," he said. "It's not very easy [to improve] because we have no time, but we are trying to solve our problems. It's not easy because on the pitch we have no time at the moment, but we are trying to talk to the players, to avoid some mistakes by video. It's not easy. We have to play every three days. "I have to think we are able to improve, and we are able to improve immediately. The result is not all in the match. "In the last match, we played better, especially in the first half. We have to solve a big problem because we stayed in the other half for 75 minutes and we were not able to score. They played only 15, 16 balls in our box and scored two goals, so we have to solve this problem, probably a problem of aggression and determination in both boxes. "At the moment, we are making mistakes with a lot of players. Everybody is sooner or later involved in a mistake. We need more to change the mentality than the players. "I have to think I will be the manager of Chelsea for a long time, otherwise I cannot work. I am not sure because I have to work, and I want to work with a long-term target." 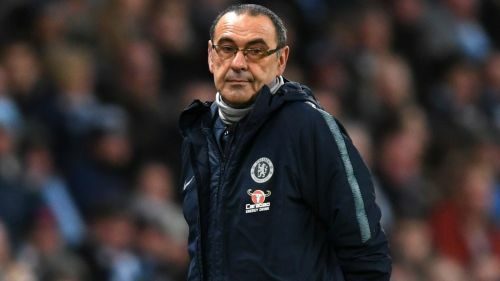 Sarri, who said he has not spoken with owner Roman Abramovich or director Marina Granovskaia this week, denies this has been the most difficult spell of his coaching career. "Not at all. I had a lot of problems in the past, especially in [Italy's equivalent of] League One, League Two - it's very difficult to be a coach in Italy in League One or League Two," he said. Sarri thinks fans were right to feel angry after the thrashing from City at the Etihad Stadium, but he maintains Chelsea were much improved in their loss to United. "I think the problem is the performance and the result against City," he said. "We played very badly. We played without mentality, without soul. For that match, I think they are right. "I don't agree for the last match because we played a good match, especially in the first half. In the second half it was more difficult, they are a physical team and defended very low, very compact, so it's not easy. We played well."